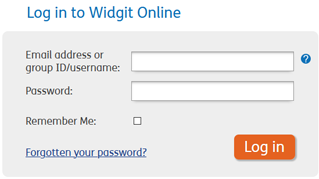 To log in, select the orange log in button on the home page or go to www.widgitonline.com/login. Individual account users can log in using the email address entered during the subscription process. Group account users can log in using the name of their group followed by a forward slash ‘/’ and their username. They can also log in with an email address if they have provided one in their account details. Only Administrators are required to supply an email address, this is optional for Users and Managers. Individual account users can use the Forgotten your password? link underneath the ‘Log in’ button for email instructions on how to reset their password. Group account users should contact their Administrator to reset their password. Users who have an email address in their account details can use the Forgotten your password? link underneath the ‘Log in’ button. If you use Widgit Online on a computer that other people can access, it is advisable to log out when you have finished your work. To do this, simply click the Log out link in the top right corner. You can access Widgit Online from anywhere with an internet connection. However you can only access the editor from one place at a time, this is called a 'session'. "You have another editing session open in another browser window or on a different computer. You can only edit documents within one session. Would you like to close your other editing session?" Click OK to start using the editor. NOTE: If you see this message but you are sure that you don't have Widgit Online open anywhere else, you should make sure that no one else has access to your login details. It is important to change your password immediately to ensure your details are safe.